The Indonesian government has seriously followed through on its SDG commitments by issuing a presidential decree to formally establish the SDGs secretariat under the Ministry of National Development Planning which is the focal point for the implementation of SDGs in Indonesia. The presidential decree also encourages all parties involved to form a committee that includes the private sector. The SDGs are aligned with “Nawacita” – Indonesia’s national development vision- which is integrated in development policies, strategies and programs of the National Medium-Term Development Plan (RPJMN) (2015-2019) and translated into the Government Work Plan (RKP) with its associated budget. Development planning in-line with the SDGs is also implemented at sub-national level through preparation regional development and action plans. The implementation of the SDGs is conducted by involving all stakeholders from government, parliament, philanthropy, business, civil society and media, as well as academics and other experts to ensure inclusiveness and coherence. To guide SDG implementation a number of documents have been made available, including the Presidential Decree as a legal basis, technical guidelines to develop action plan, metadata of SDG indicators, communication strategy, and SDGs dissemination to all stakeholders, both at national and sub-national levels. 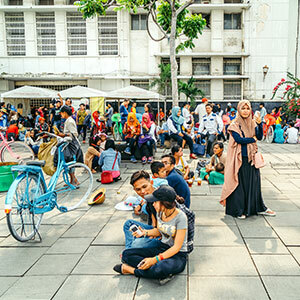 In 2017, Indonesia developed its first Voluntary National Review report based on technical guidelines provided by the UN. The process to produce the report has applied inclusive, participatory and transparency principles by involving all stakeholders coordinated by Ministry of National Development Planning/National Development Planning Agency and supported by the Ministry of Foreign Affairs. SDGs have become a new paradigm for all stakeholders and main topic in many discussions related to development challenges. In March 2016, IBCSD together with three other company associations agreed to establish a communication forum called the Indonesian Philanthropy and Business Communication Forum for SDGs (FBI 4 SDGs). The forum today has 15 members from different business associations representing thousands of companies. It has established itself as the official forum for the private sector and is recognized by the government in order to coordinate SDG implementation with the private sector in Indonesia. We have been closely working with the SDGs Secretariat to give inputs to mainstream the SDGs into the National Development Mid-term Plan (RPJMN) 2020 – 2024. We have also been part of the association forum – FBI 4 SDGs – and we are involved in a working group and providing information about SDG tools and resources that have been developed by WBCSD and partners. Become strategic partner for government where this working group can be included in SDG forum, communication and discussion.